Internet Memes And 'The Right To Be Forgotten' : All Tech Considered Becoming Internet-famous is a gold mine for some, a nightmare for others. The world of memes can pit free speech against the desire for privacy. And laws generally aren't keeping up, an expert says. 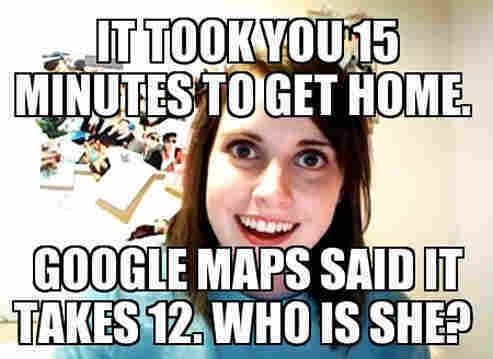 "Scumbag Steve," "Overly Attached Girlfriend," "Bad Luck Brian." All these Internet celebrities have one thing in common: They didn't intend to become famous. Their pictures just happened to go viral. Is nothing off-limits? That's something Kyra Pringle has been asking herself in the past couple of days. The South Carolina resident recently found out her 2-year-old daughter Mariah's birthday pictures were being shared online by thousands. Mariah has a rare disorder that impairs her learning and motor skills. It also affects her appearance. As Mariah's picture spread, so did the nasty captions and altered versions of the image. The Pringle family was horrified. "The smile that you guys think is funny or the smile that you guys are comparing to a leprechaun, the smile that you guys are comparing to all these disgusting things like the things that you are saying about my child," Kyra Pringle told a local TV station. "She's not a monster, she's not fake. She's real, she is here." Some unwitting meme celebrities embrace their fame. Earlier this year the Washington Post profiled Kyle Craven, more popularly known as "Bad Luck Brian," a meme about a boy with hilariously and often very dark bad luck. Craven, who was always a class clown, capitalized on his fame. The Post reports that between licensing deals and T-shirts, he has made between $15,000 and $20,000 in the past three years. Others have tried to use their Internet fame as a catapult for an entertainment career. Laina Morris' picture is easily recognizable — the bulging, crazy-looking eyes and loopy smile made her best known as the Overly Attached Girlfriend who makes ridiculous demands and accusations. Morris has tried to create a comedic career out of her online celebrity. She has a YouTube channel where she posts skits, and a Twitter account. But for others, it's a nightmare. Perhaps one of the most notable cases is Ghyslain Raza, "Star Wars Kid," who in 2003 became one of the first viral memes. This was before YouTube launched, and Raza did not even post the video. He simply taped himself doing Star Wars-style fighting for a school video club. His classmates secretly posted the video online, and it spread like wildfire. By the end of 2006, it had been clicked on more than 900 million times. It has more than 27 million views on YouTube and was parodied on Family Guy, The Colbert Report and South Park. For Raza, it was a teenage nightmare. He was bullied incessantly, to the point that he became depressed and dropped out of school to go to a children's psychiatric ward. Raza's family initiated a lawsuit against the families of the four students who posted the video online. The family eventually dropped one of the cases and settled out of court for an undisclosed amount. Most people who have sought legal remedies have failed, Hartzog says, adding that it comes down to free speech. But, he says, "The idea that free speech is without consequences is silly. The consequence is that people's reputations are involved here. It does very likely impact not only emotional stability, but people's ability to find a job. Because now we know that everyone's resume is not the thing they submit in an email, but rather what comes up under a Google search." And not all memes are created equal. Hartzog says there's a strong argument that women are saddled with the more sexist and mortifying jokes. "If you look at the statistics, most of the unwanted attention that we see on the Internet typically has more negative consequences for females," he says. One example is Alix Bromley, who posted provocative photographs on her social media account in 2006. The pictures were republished on various sites without her permission and eventually featured in the men's magazine Loaded. Bromley filed a complaint against that magazine but lost because the pictures had already been widely distributed before the magazine published them. The European Union and Argentina have instituted a concept known as "the right to be forgotten." It allows for individuals living in these places to ask search engines like Google to de-index certain pages that are irrelevant, false or not newsworthy. It's a concept that has been controversial, as it raises concerns about public records and freedom of information. The battle has been playing out between Google, which is fighting to apply Europe's "right to be forgotten" only in the EU, and EU regulators, who want the company to apply the rule globally. Ultimately, the threat of unwanted Internet attention has led to the rise of ephemeral media like Snapchat, a photo messaging app in which users take photos, record videos, add text and drawings, and send them to a controlled list of recipients, with a time limit for how long they can view the Snaps. For those who did not grow up in an era where everything got recorded, it's hard to imagine the mortification of having our silliest teenage moments live on forever, beyond a photograph stowed away in mom's garage. "It's important for us to fail when we are young," says Herzog, the associate professor. "That's how we learn. That's how we develop our sense of right and wrong. That's how we develop our sense of empathy. And the ability to move past that, and not have those same things haunt you." An earlier version of this story said that Woodrow Hartzog is an associate professor at Stanford University. He works at Samford University.